Cato Park’s history is vast. My mission has been very diverse in searching for, and successfully finding, leads on Cato Park and the land it once was. During my conversation with Dennis Strawn (City employee and park advocate), he was able to show me the property lines (via Kanawha County Parcel online) and explained that Cato Park was once referred to as the “Gebhart Property” before the City of Charleston purchased it. 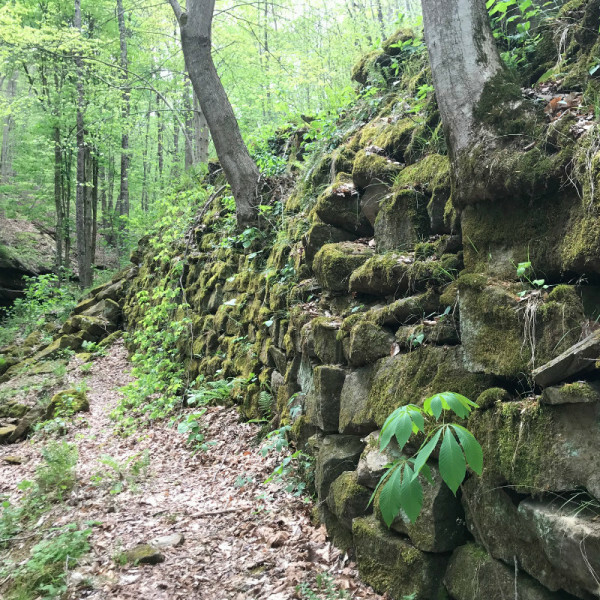 At one point, before the City purchased what they did, Cato’s trail system was surveyed and broken off into appropriate lots for folks to buy. As a lover of Cato’s trails and the park itself, I couldn’t imagine all of this beautiful land covered in houses and streets. It’s fascinating to go online and see what had been surveyed and developed for Cato Park. Strawn was also able to show me “Part Two” of the Cato Park land over on Pacific Street. This land has not been developed into the park, nor by the City, as of yet. Strawn and Allen have both told me the brief stories of Cato. One being “Charlie Brown’s Dump”, where a man allowed people to come in and dump their large appliances where he lived, so that he could fix them and sell them. From how the stories go- and how the debris still lies- he had quite the hoard of items. Many people refer to the trail off of Garrison Avenue (that follows the creek to the waterfall) as “Charlie Brown’s Hollow”. You would never know these stories without asking the locals who love this park.